The stylish Bhaiya-Bhabhi Rakhi is a set of two Rakhis for both your loving and caring brother and sister-in-law. The enthralling art of this traditional Rakhi and Lumba set for the favourable occasion of Raksha Bandhan. The combo consists of Rakhi For Bhaya n Bhabi with 1 Kg Rasgulla. 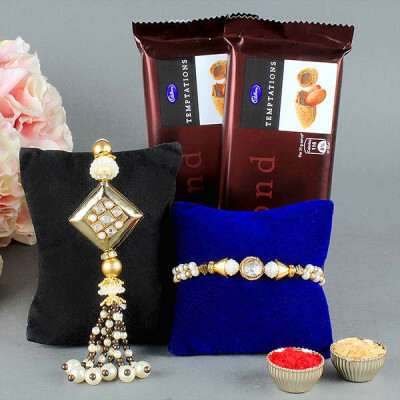 When you are searching for a gift hamper that will make your dearly loved bhaiya bhabhi pleased, then this marvelous Rakhi combo just for you! 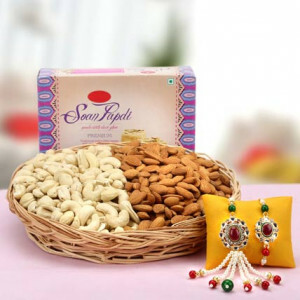 It includes an adorable Lumba-Rakhi set for your loving bhaiya bhabhi and Half Kg Kaju Katli. Bhaiya-Bhabhi Rakhi is the exclusive couple Rakhi that shows the love and care for them. 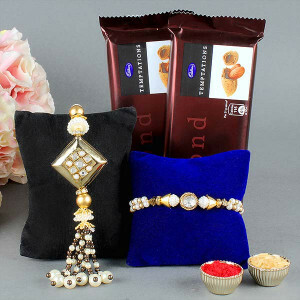 Secure love, care, and warmth for them and astonish them with this stunning Rakhi For Bhaiya n Bhabhi with Dry Fruits. Love and surprises are the essences of Raksha Bandhan. 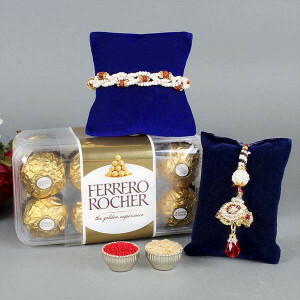 On this Raksha Bandhan, surprise your Brother and sister-in-law with this special Rakhis that has the prettiest design along with 16pc Ferrero Rocher. Acquire the exceptional route on this Raksha Bandhan and surprise your Brother with this beautiful combo that contains a 500gm Box of Cookies, and a beautifully crafted Rakhi for bhaiya and bhabhi. Acquire this elite couple Rakhi to tie on the wrist of your bhaiya and bhabhi. Secure love and affection for them and surprise them with this attractive combo of bhaiya-bhabhi Rakhi with Kitkat Chocolate. The fashionable Bhaiya-Bhabhi Rakhi is a set of two Rakhis for both your loving brother and sister-in-law. 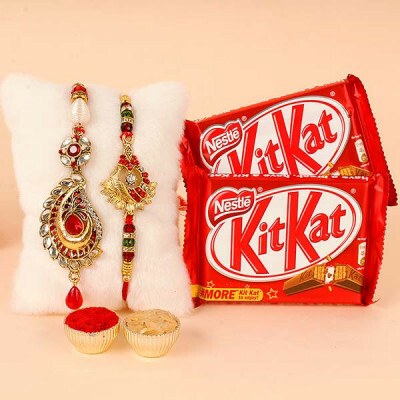 The unique rakhi combo consists of charming art and ornamenting conventional Rakhis along with Lotte Choco Pie. The desires and blessings that are shared in this Godly festival are uncountable. So, does the stuffing of this unbelievable hamper. This hamper includes: beautiful For Bhaiya n Bhabhi with Roli Chawal and 4 Five Star Chocolate. This combo is certain to make Raksha Bandhan even more happening. Raksha Bandhan is a divine festival that fosters love, care, & togetherness and reinforces the true bonding between siblings. 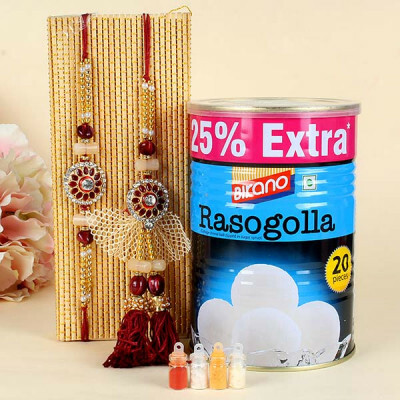 On this auspicious occasion, buy this beautiful combo that contains attractive Rakhis For Bhaiya n Bhabhi with Roli Chawal and 2 Dairymilk Silk. Raksha Bandhan is a favorable occasion celebrated with a lot of faiths. This Rakhi combo consists of two Rakhis, one is Bhai rakhi and the other one is Bhabhi Rakhi. Combo also includes 500kg soan papdi, dry fruits, roli, and chawal to complete the celebration of this occasion. Every occasion wishes the lovability of sweets. Raksha Bandhan has a great relation with sweets. 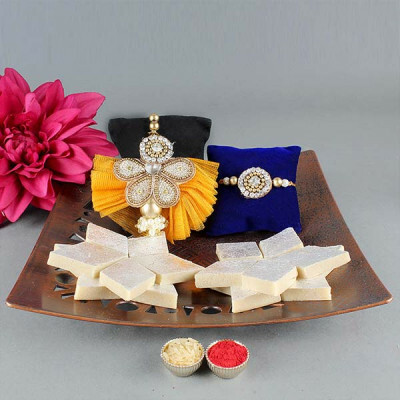 Thus, this rakhi purchase this combo of Kaju katli which will attract your brother's feeling and your brother will be craving to have an urge to overwhelm this Kaju katli. The combo consists of Kaju katli, bhaiya bhabhi rakhi, and roli chawal.